You might not have known it from their NLDS performance, but the Braves had one of the NL’s best offenses in 2010. They certainly bookended it in the wrong way, scoring 3.7 runs per game in April and 3.4 runs per game in September/October. But from May through August they absolutely crushed the ball, scoring 5.03 runs per game during those 109. Unfortunately for them, it was the April and September versions that showed up in October. That resulted in just runs in four postseason games, forcing a first-round exit. It wasn’t hard to see coming. Looking at the Braves’ runs per game throughout the season, it might appear that they were a decently consistent team. 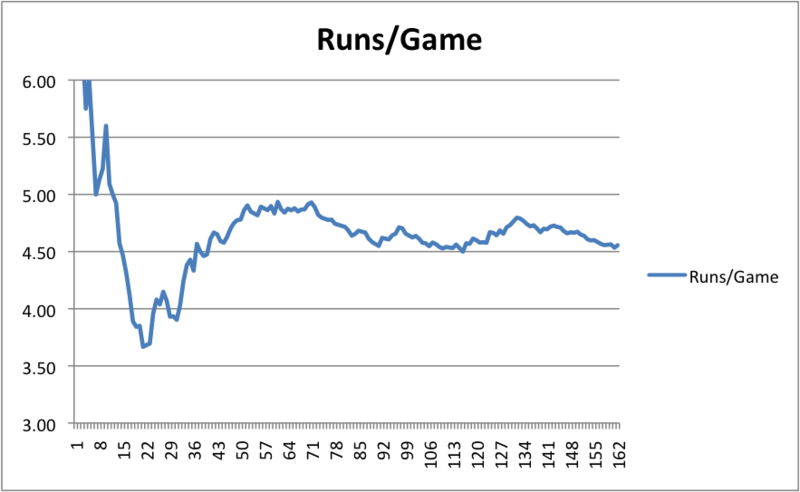 After overcoming their poor start they stayed between 4.5 and 5.0 runs per game, normally trending towards the 4.5 side. Had they scored those 4.5 runs per game against San Francisco we would have had a different series. But that, of course, is a fallacious mode of thought. As Matt wrote before the postseason began, 2010 is not a constant. Many things change during the course of a six-month, 162-game season. That renders teams completely different at the start than at the finish. For some teams this is a good thing; the Phillies, for instance, went from a team that couldn’t buy a hit into one of the top offensive teams. The Braves went in the opposite direction. The reasons for this are pretty clear. When the team went on its four-month tear it had its best hitters in prime lineup spots. Here’s how the top hitters fared in those torrid months. There were ups and downs for sure, but there was always another guy to pick up the slack when another one slumped. When Troy Glaus went into his free fall, the team picked up Derrek Lee to fill the void. Yet that didn’t help much. Chipper Jones got injured. Martin Prado limped through September. The team just wasn’t clicking as it did earlier in the season. The September performances, while in the heat of a playoff race, were not at all impressive. When the infield crumbled, so did the team. Omar Infante did a good job replacing Jones at first, but fell hard in September. Prado didn’t help matters by playing hurt. That left Brooks Conrad to fill in. He had a good season as a utility guy, but he gets exposed in regular duty. At first it was his arm strength, which necessitated a move to second. Then it was his Game 3 performance. Lee did his best, but he simply could not carry so many ineffective and injured players. The final point against the Braves was the pitching they faced. They might have averaged those 4.56 runs per game during the season, and their peak might have suggested an even better performance was possible. But that all changes when facing Tim Lincecum, Matt Cain, Jonathan Sanchez, and Madison Bumgarner. Those four allow far fewer runs than the average pitcher the Braves faced during the regular season. So it wasn’t only injuries and ineffectiveness that halted the Braves’ season. It also had something to do with running into a string of excellent starting pitchers. As we’ve seen so many times in the past, the Braves became exposed when injuries arose. Maybe September would have been different had Prado and Jones been around. Maybe the team would have fared better against the Giants with those two in the lineup rather than Conrad and a slumping Infante. But injuries happen. The Braves just didn’t have the depth to overcome all of them. It certainly was a sad ending to a very good season. We hoped you liked reading The Braves Ill-Timed Offensive Collapse by Joe Pawlikowski! and other things. It’s still a good time to be a Braves fan. One more thing I’m looking forward to: Melky Cabrera being non-tendered. Dude pretty much screwed us over all season. Damn, I wish they would call a live press conference to non-tender Melky. It would be the media event of the offseason! “Screwed us over” — are you implying Cabrera was not trying to play well? When a player doesn’t play very well, and nobody was really expecting him too, it makes more sense to blame the management for feelings of screwedness, no? I can’t wait for this nontender! Bowie, I had exceptionally low expectations from Melky Cabrera entering the year, and he still somehow underperformed them all. I thought he’d be a semi-regular who performed at a below average pace. Instead, he was nearly a full-time starter who performed a below REPLACEMENT level pace. I’m sure the Braves expected something closer to the Melky Cabrera from 2009 than the 2008 version, perhaps even better since he only turned 26 during the season. I’d say his sub-par play was perhaps a bigger problem for the Braves than the injuries to Chipper Jones and Martin Prado.